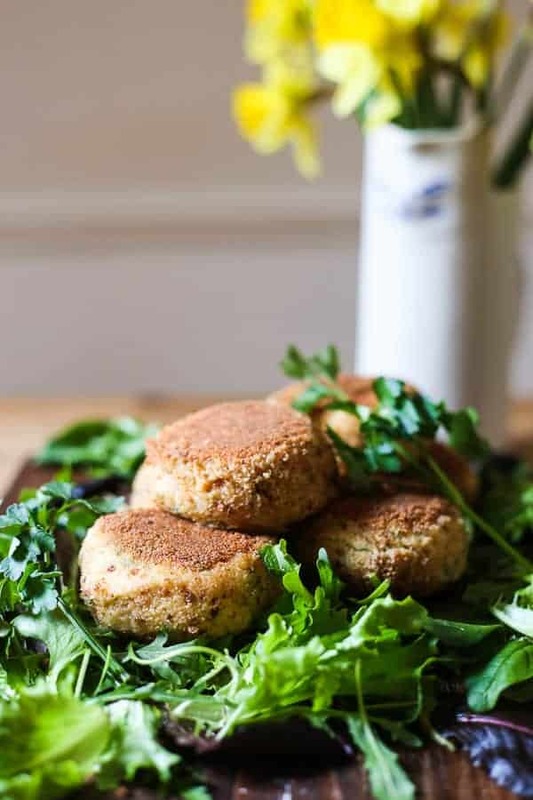 These Simple Salmon Fishcakes were one of my Nan’s most celebrated recipes. Home comfort cooking at its best. This recipe was originally published on the blog in 2014. I have modified it to a gluten-free recipe and included new photos. This pregnancy I was a little more on the ball as regards making freezer meals for the first few weeks of Beau’s life. I always had intended to do the same for Cole but I was little prepared for quite how much of an overwhelming time having a newborn would be and I just assumed I would be fine making my own simple meals everyday. Now with a toddler, a newborn and a husband who is back at work I am so grateful to have carved out some time for meal prepping a couple of months ago and I am reaping the rewards now. One of the pre-requisites for my freezer meals was an emphasis on comfort food and real homely cooking. The first meal I craved after coming home from the hospital was a lasagne which is my mum’s signature dish. It reminds me of family and felt like the perfect meal to welcome our new bundle of joy home with. I also have stashed in the freezer a Shepherd’s Pie, these Barbecue Spare Ribs and a batch of my late grandmother’s Simple Salmon Fishcakes. Now, my Nan wasn’t a great cook, she was very much a child of rations, plain food and making do, but there are a few things in her repertoire which I crave as an adult and get such a childish pleasure from. Her trifle was in a class of its own, made from Bird’s custard, tinned fruit puree and a packet of sponge fingers, but it couldn’t be bettered. Her beef stew consisted of beef simply stewed with potato and carrots until it had boiled down to almost a thickened soup, but its comfort factor cannot be surpassed. It was her salmon fishcakes though which our family has always considered her culinary masterpiece. When we needed a bit of cheering up, perhaps we’d had a long week at school, it would perk us up no end when we’d get home from school on a Saturday lunchtime (yes, we went to school on Saturdays, don’t ask) and Mum would say that Nan had made us some fishcakes for a treat. There was no better reward for double maths, double chemistry on a Saturday (seriously that was the weekend lesson plan, sadists ran our school) and we could easily eat the whole plateful she had made us to last the weekend in a single sitting. 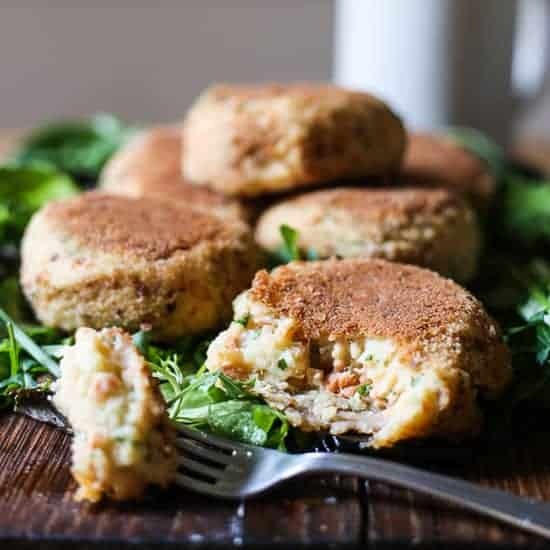 These are probably the most simple salmon fishcakes you will come across and they have a very special and secret ingredient, tinned salmon. When I first found out that was how she made them I was taken aback. It just seemed so wrong. But really the taste is unique, and despite how much I love a good fresh salmon fishcake, Nan’s are imbued with a more intensely sweet flavour which is entirely different. And to be honest, there isn’t a whole lot of salmon in these anyway. 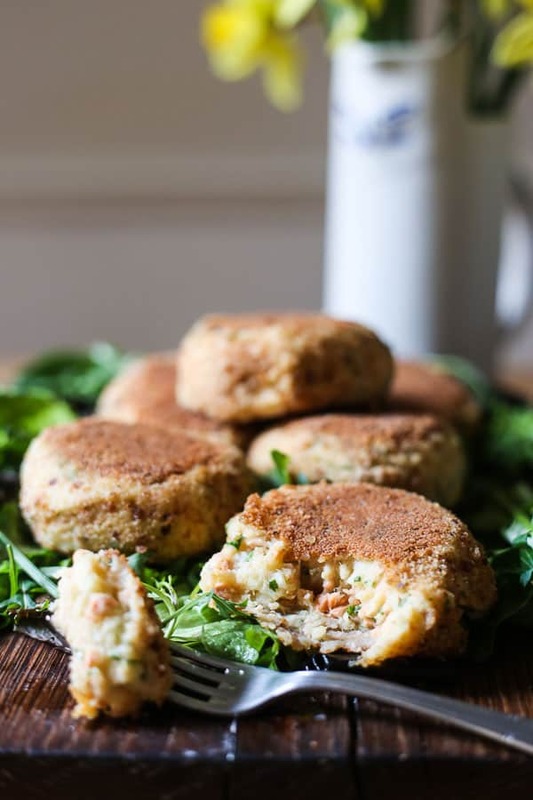 These fishcakes are more like mashed potato cakes kissed with a sweet blush of salmon. However that salmon flavour perfumes the whole cake. When I asked Nan once how she made them she just said mashed potato and tinned salmon. That was her recipe and really all you needed to know in her eyes. Now, I’ve taken a liberty or two with my Nan’s recipe as I have added a few snipped parsley leaves, just because I couldn’t resist. I also included a generous amount of ground white pepper for a bit more of a kick and salt, which I know Nan definitely wouldn’t have used. She didn’t really buy into seasoning. Plus these days I have been making my Simple Salmon Fishcakes gluten-free and to be honest there is no discernable taste difference from the original version. I just swapped out the plain wheat flour for Doves Farm plain gluten-free flour and whizzed up a loaf of good gluten-free bread in the food processor to make the breadcrumbs. It made a huge amount so I have stashed the leftover breadcrumbs in the freezer for future meals. So useful and you can use the breadcrumbs straight from frozen. The way to serve Nan’s fishcakes is and always will be non-negotiable, with brown sauce. It is in fact the only time I will ever eat brown sauce as if I’m pressed I’m not sure I really like it. However, here, when the crunchy crumbed shell of the fishcake which encases the sweetly soft interior is paired with the deep tang of the brown sauce the result is sublime. It’s the only thing in the whole world I feel like eating at the moment. Do note though that a lot of brown sauces are not gluten-free due to the malt vinegar and sometimes rye flour which is used. I prefer to make my own (you must remind me to post the recipe!) but otherwise Tesco’s own brand is gluten-free. Peel and quarter the potatoes then place in a large pan of salted boiling water. Bring the potatoes back to the boil then simmer for 20 minutes until the potatoes are soft. Tip the mashed potato into a bowl and leave to cool for an hour then cover and refrigerate for at least 2 hours until the potato is cold. Drain the salmon and mix into the cold potato and the parsley leaves with a fork until evenly dispersed. Shape the fishcakes into patties of equal weight, about 125g, then place on a plate and put back in the fridge to settle for half an hour. Arrange the flour, beaten egg and breadcrumbs into three separate bowls, then remove the fishcakes from the fridge and coat each fishcake; first with a light dusting of flour, then with the egg, then the breadcrumbs. Pour the olive oil into a wide heavy based saucepan and heat until sizzling. Then turn the heat down to low. Shallow fry the fishcakes in two batches, 5 minutes on each side, spooning some of the oil up the sides of the fishcakes to ensure they are golden all over, then place on kitchen towel to absorb the excess oil. 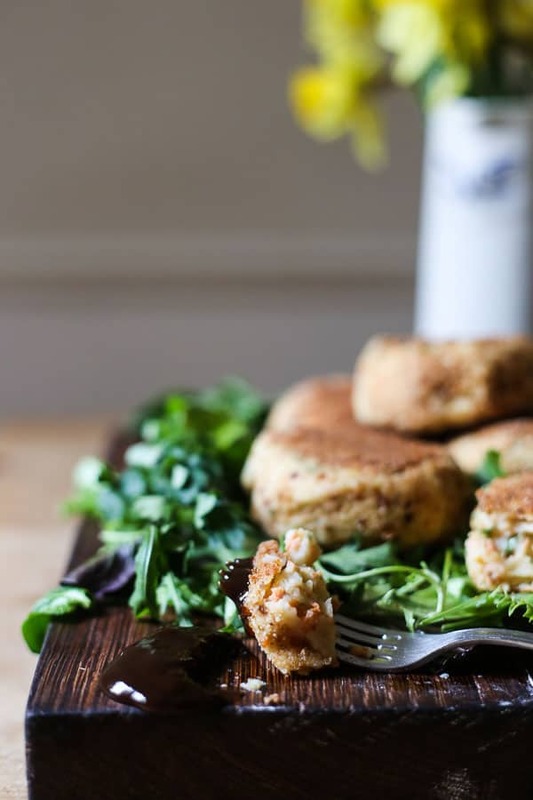 Serve the fishcakes with a light salad and plenty of brown sauce. These fishcakes freeze very well so make a huge stash for emergencies and re-heat in the oven. 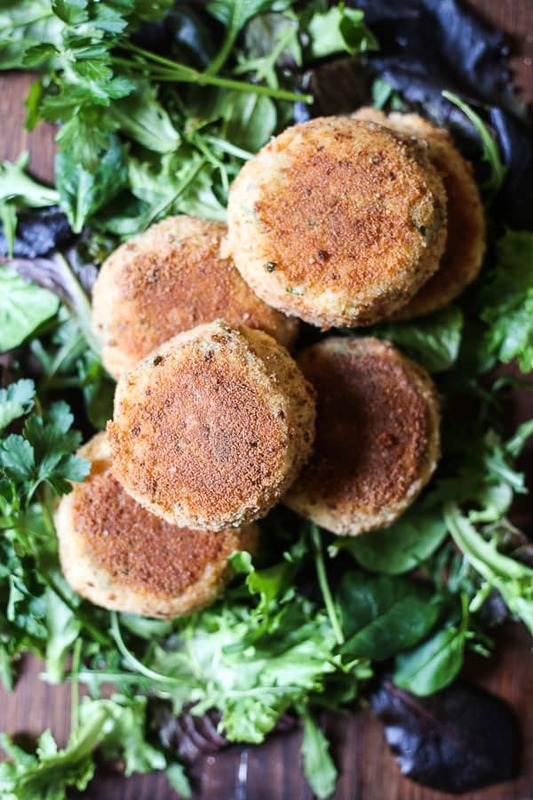 *If you use leftover mashed potato then these fishcakes come together in a snap. If you’re making the mashed potato especially for the fishcakes then you must wait for them to cool completely in the fridge as warm potato will fall apart when you’re shaping the fishcakes. *I actually use a potato ricer for mashing my potatoes which ensures lump free and smooth mash without any gummy texture. To achieve this I place the salted butter into the saucepan and pass the potato through the potato ricer into the pan of butter, then give a jolly good stir into the butter once all the potato has been riced. Hello, so lovely of you to drop by. I am Georgina. I bake a lot, eat a lot and love writing about my gluten-free kitchen adventures here. I run a gluten-free cake business and have a stall at the local farmer’s market selling my cakes and preserves. I have 2 cats, 1 dog, 1 husband, a delightful toddler who runs me ragged and a newborn baby boy.